Here is a basic introduction to the Chinese language. The best way to learn any language is to listen to a native speaker and then see what they make of your pronunciation. Chinasage does not provide a language course, we offer only a brief introductory guide. The official and predominant Chinese dialect is Mandarin or 普通话 pǔ tōng huà literally universal common speech; it is also known as the Beijing dialect. 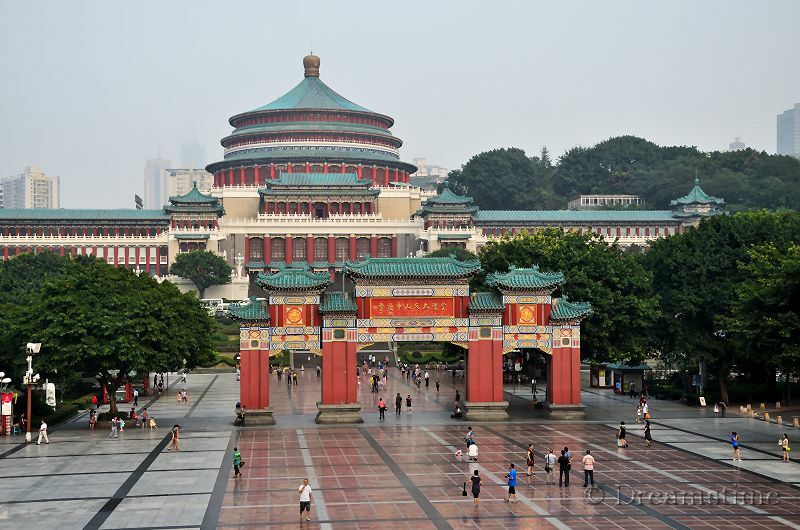 In southern China and around Shanghai the spoken language is markedly different and the locals may not understand putonghua, however they will be able to read the written characters and may be able to understand the written form called ‘pinyin’. c tz or ts As in rots. It has no 'c' sound at all. q tch As in cheese, but has a strong t in front of the ch sound which is needed to distinguish q from ch. r re A softer sound than in English, often over-emphasized by beginners. As in leisure tongue loosely rolled to the front not the middle of the mouth. x hs No exact equivalent in English so it takes some effort to learn how to make this sound. Similar to sh in she but with an initial h sound. y y A very soft modifier of the following vowel which is not very distinct. Yi is more like ee than ye. The reason for the unhelpful pronunciation for ‘c’ and ‘x’ is that pinyin was devised in the 1950s when Russia had great influence in China and so the Cyrillic script can be blamed for this. er R A difficult sound as it is more accented than expected and is made with an open mouth ooh argh! ü oo As in French or German umlaut, a long oo sound. The most useful first words in any language are yes and no. Combined with hand gestures they allow a rudimentary conversation to take place. For yes the Chinese have a number of possible characters or words, there is no exact equivalent for the English yes. Firstly there is shi which means correct which is almost the same as English is. It is used to state the current state of things, there is more on this when we come to verbs. The second is hao which means good, OK and is frequently heard in spoken Chinese as a confirmation. Saying no is easier as here the character bu can be used in most situations. If a question includes shi then it is usual to say no with bu shi. After a basic yes and no, the next step is introduce yourself to people. This is one of many occasions when it is easier in Chinese than in other languages. I, me in Chinese is wo and you is ni. Having mastered you the phrase for hello in Chinese follows naturally as it is just you, OK? ni hao. It's an interesting comparison that in English we use good in farewell goodbye rather than in greeting. Referring to other people and things needs he; she and it, in spoken Chinese the sound ta is the same for all of these: men; women and things. However in the written language a different character is used to distinguish them. The fact that the same sound is used exemplifies the gender neutral nature of the language, there are no complex gender specific forms to remember. It suggests a long standing equality between the sexes. Having learned the singular personal pronouns I, you and he/she the extension to plural forms : we, you and them is simplicity itself, you just need to tag an extra character men to turn wo; ni and ta into plurals. So women is we, nimen is you (plural) and tamen is them. Next we must have some action. Verbs are much simpler in Chinese because there are no irregular forms to remember as there are in English. (e.g. I do, he does, you go, she went) . Here are some common verbs: shi for is (this has already been mentioned as it is also used on its own as yes = it is); qu to go and lai to arrive. For the traveler the verbs for zou walk and mai buy are very useful. One of the first verbs you need is the Chinese for have or has. If you are asked a question whether you have something you can answer with just you - I have and if you do not have with mei you - I have not. The other word for no : bu is not used for possession, the combined mei you is a very frequently heard phrase, particularly asking for tickets and out shopping. Nouns are the next ingredient to introduce to the mix. In Chinese a character can be a noun or a verb depending on how it is used, there are no strict categories as there are in English. It would be impossible to have one character for every possible thing, and for all but the very common words you will see nouns made up of two or more characters rather than just one. So huo che is train and fei ji plane, the two characters have meanings on their own. huo means fire and che is vehicle, so a train is a fire vehicle (from the time of steam trains) and qi che is a car with qi for gas used in place of huo. For plane fei ji the fei is for fly and ji for machine, so a plane is a flying machine. Chinese is very flexible in the way characters can be combined to give different meanings. However there are relatively few 'words' that are made up of two characters where the characters can not be used on their own. For travelers the names of countries is one of the most useful nouns to learn as one of the first things to be asked is Where do you come from? and to reply you need the names of countries. Some country names are two character names with guo for country as the second part. America is mei guo; England (UK) is ying guo; France is fa guo and China is zhong guo (see entry on Name of China). The names for America, England and France have all taken Chinese characters that roughly sound like the country in English, so mei for America means beautiful; ying for England means flower or hero and fa for France means law. Compass directions are very important to know in China. Chinese people often give directions using them as cities are laid out in a grid system; they are extensively used in place names and province names; so you have probably heard them all before. Beijing is northern capital; Hunan is lake south; Shandong is mountain east and Shanxi is mountain west. The character for mountain 山 shan is a very old pictograph character. 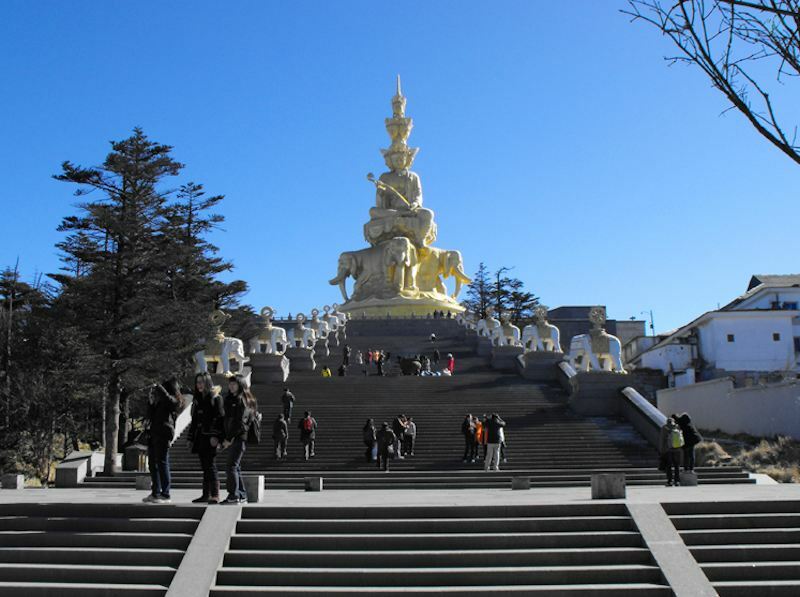 Samantabhadra statue at Golden Summit on Emei Shan, Sichuan. April 2009. With numbers you can start counting things. However one complication of Chinese is that you almost always need to prefix the noun with a measure word, you can not say three tickets : san piao, you must use the appropriate measure word, in this case it is zhang and so you need to say san zhang piao. Zhang is used for a range of 'flat' items such as paper; table; bed; picture; stamps. The English equivalent is when we say three bottles of beer; six bundles of wood; one pot of tea etc..
To count people you can use the most useful and general measure word ge as in si ge ren - four people. The measure word ge can be used for anything when you do not know the proper measure word, it may sound a bit strange but will be understandable. One of the reasons for the measure words in Chinese is that there are so many words that sound similar, putting in the appropriate measure word makes it more likely that the meaning is correctly understood. You may have noticed that there are now two shis, one for is and one for ten. They do differ in tone of the vowel sound, shì for is has fourth tone while shí for ten has first tone. This is why tone is so important in Chinese. Associated with nouns are adjectives that help describe them. Some of the most useful are those that describe size and color. The matching opposites of size are big da and small xiao. In this case the characters are easy to remember, they are described in our Chinese character introduction. Adjectives are put before the noun that they relate to (as in English) so a big lake is da hu and a small plane is xiao fei ji. The characters for colors often have their origins in the dyeing of silk, the first part of the characters for red and green both use a representation of silk. A red car is hong qiche and a yellow ticket is huang piao. You can also use the country names as adjectives so an American person is mei guo ren and a Chinese person is zhong guo ren. All these basic language elements can be put into simple sentences. Up until now the pinyin tone marks have been missed of. For sentences we should start including the tones as they are so important to being understood. I am going to China. Without a time specified, it is not entirely clear when this person is going to China, this introduces the need for tenses to be applied to verbs. 45 people. The way to say numbers has been explained in our numbers section - the formula is simply 4 x 10 + 5. She is an American. This is a combination of elements already seen. In this phrase the measure word ge can be omitted before person. They are not French. Making a negative statement just needs a bu in front of shi. I have six red tickets. The same subject - verb - object structure is used with different elements. The adjective goes after the measure word. In other languages it would now be necessary to go on a lengthy and boring digression into the various tenses of verbs with complex irregular cases (e.g. going; go; will go; went). Not so in Chinese; because each character is self contained adding any further meaning must come with adding whole characters. In most cases the tense can be inferred from the context. Writing Yesterday I went is a bit redundant as Yesterday I go has the same implicit meaning, similarly with Next week you will go the action is in the future and putting in will is not really necessary. This is the approach generally taken in Chinese, the first part of a sentence will establish the time as past, present or future and so the intended tense of the verb is clear. In the same vein, turning a statement into a question is simple in Chinese, the word order does not need to change. There are various ways to do this, the simplest is to just put the character ma at the end. How are you?. The standard greeting ni hao means literally you well can be turned into a question by adding ma. Are you English?. Just adding ma at the end turns a statement into a question. There are cases when you need to know whether something is still going on e.g. walking or has been completed e.g. walked, this distinction is usually made in Chinese by adding the modifier le to the verb. So arrived is lai le and bought is mai le. He bought three tickets. Adding the le distinguishes bought from buy and buying. So far little English words like a and the have not been included as they are not present in Chinese, another welcome simplification. However, one very useful and heavily used article is the possessive article de that when put after a pronoun or noun or a phrase makes it the subject of possession. The simplest case is turning I wo into mine wode; you ni into yours nide. Your plane. Just adding de makes it pertain to you. We hope we have convinced you that the Chinese language is not as hard to learn as many people say. You need to know the basics of the language if you want to learn about Chinese culture. Inevitably learning a new language requires a larger vocabulary than we can present here, and we have made a few simplifications to give a flavor. We hope you will want to learn more of this important and fascinating language. Please go on to look at our second lesson on Chinese : Lesson 2 and then Lesson 3. Citation information for this page : Chinasage, 'Starting to learn Chinese', last updated 5 Dec 2016, Web, http://www.chinasage.info/langbasic.htm.